Finally the shed has arrived today. Big excitement and a big truck delivers, the shed. It was so much fun for the kids to watch a crane lift all the shed parts up and over our gates. The driveway was too narrow to fit the truck inside. This is how the yard looked at the beginning of August. The garage arrives - now it gets assembled, with my lovely rose garden behind, re-landscaped by Bruce and I last weekend. Enjoying my new yard -lots more fun in the garden to come. I've been recuperating from surgery and using the time to work on hand piecing my Double Wedding Ring, while watching re-runs and live Bonnie Hunter Quiltcams. 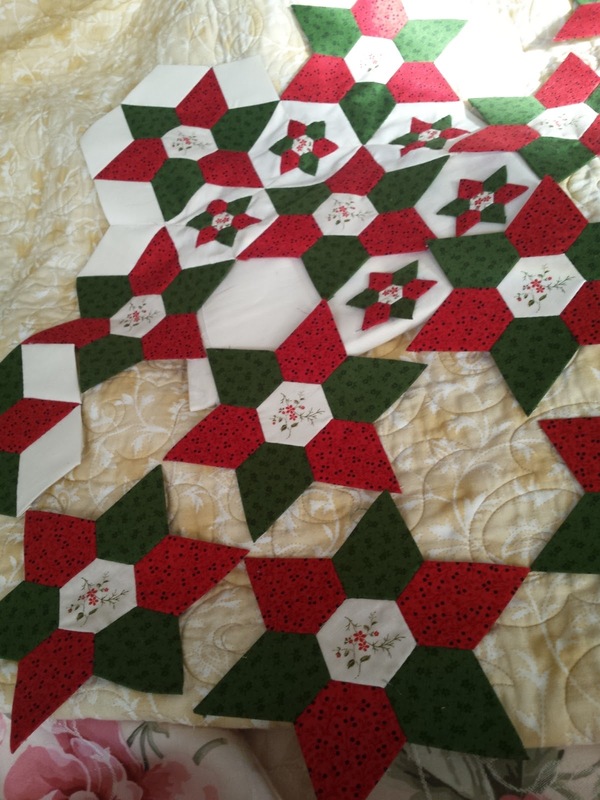 Bonnie has a wonderful blog and is into scrappy quilting in a big way. This project was supposed to be finished last October for my husbands 50th birthday, I guess life gets in the way - and other sewing projects. I'm enjoying the journey and that is the main thing. I'm now up to the last row, it will be five x five, and I think I know how I'll finish it. I'm thinking of a cream floating border then a border with flying geese and square in a square blocks. I'll then do another cream floater and a final border of the feature fabric which are T Model cars - just one of my husbands hobbies. In other news - we are finally getting the new shed. Bobcat has been in for two days and the concrete should be poured by end of this week, all going well. The shed itself is due for delivery and erection mid September - can't wait, it's been a long time plan finally coming to fruition. 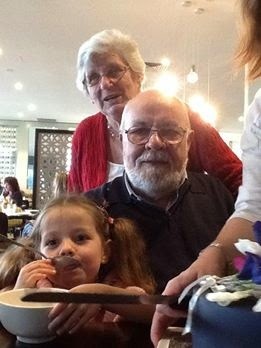 Happy Birthday Opa - what a great time. 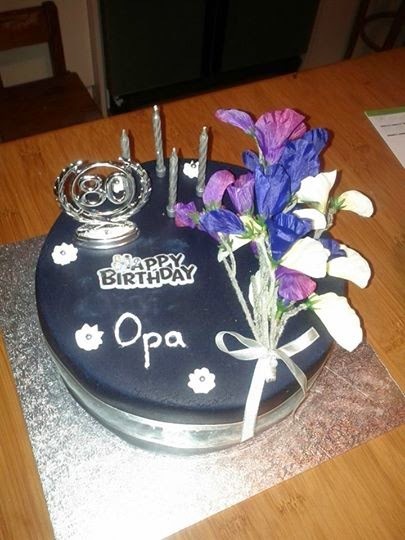 Hope you liked the cake Dad - I enjoyed making it and finding the flowers - sweet peas. 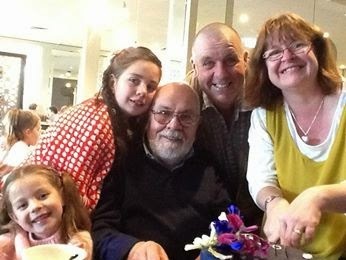 Had a lovely lunch together with the family. The Cake. It was yum. Lovely photo of Mum and Dad. Getting back into the exercise regime, I was at the pool by 7:30am for aqua aerobics - a wonderful start to the day followed by a well earned latte - nice. Then Bruce and the girls harvested our nectarine trees laden with fruit. I thought I would just do two batches, so love my vacola kit inherited from my mother in law a couple of years ago. Just added some lemon juice and peel into each jar with water - no added preservatives. these will be wonderful with yoghurt - we've already taste tested a bottle, while still warm. According to Ruth - yum, so it's a winner. While these were underway I had the slow cooker on with Ham Honey Citrus - a great recipe from Stephanie O'Dea 'A year of slow cooking' blog. I've done this recipe before, quick and easy to prepare - I just use the small smoked hams, without the bone - big enough to feed eight, so great for two nights. Whipped up a potato salad and girls made a lovely green salad. Will now spend a peaceful evening on the couch doing some hand sewing. It's been a great day after a challenging week. Into this. It only shows a five by five layout - all blocks are made to make it seven by seven but couldn't fit it next to the Christmas tree. I'm creating the borders using Bonnie's leader and tail end method while joining the blocks together. Sewing is the slowest part as I can't sit for too long. 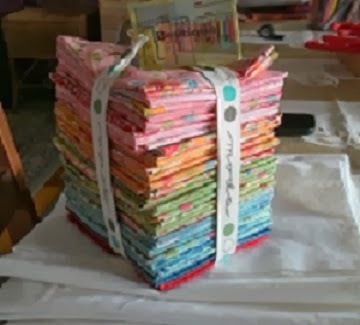 For those that may look close at the photo, don't panic I also noticed that I had turned a couple of my blocks the wrong way - after a little use of the seam ripper tool, all my pink squares are now heading in the same direction LOL. 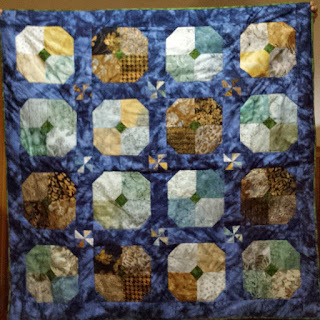 I've really enjoyed this mystery quilt "Celtic Solstice" and can't thank Bonnie enough for her generosity and time in putting this out there for all of us to enjoy. I've learnt many new sewing techniques and made many new blocks, I'm usually a square or rectangle person so this has broadened my experience, Thankyou. Hopefully I'll have the flimsy finished in time for the link-up in February. The gingerbread house has been constructed, just needs some final lolly additions by the girls in the morning. The tree is decorated, the gifts are wrapped and Santa and his reindeer have been. All that is left are some carrot tips and bits of gingerbread men. The cherubs are all tucked up in bed asleep, safe and sound. Now we sleep until awakened by excited little voices in the early morn. I know in years to come I will miss this. 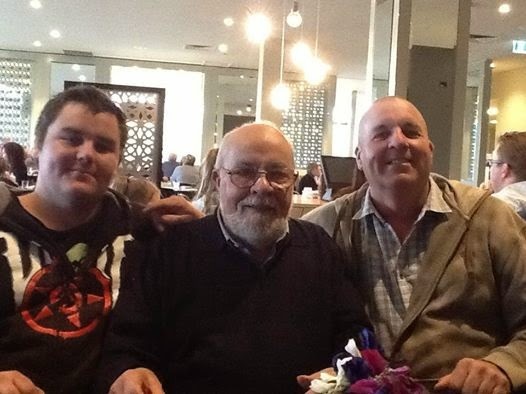 I wish you all a Merry Christmas and a safe and happy New Year for 2014. May it be full of happy times. Happy Christmas Eve - are you out there still running around or resting, all organized and ready for the big day? I had a finish, ready for tomorrow. As usual Anita, of Hillside Quilting, did a beautiful job of quilting my batik quilt. A gift for my brother and sister-in law in celebration of them both turning 50 this year. I presented them with the flimsy earlier this year, but it was a boomerang so that I could get it quilted and bound. Amusingly I finished the last stitches while watching the Rocky Horror picture show on TV last night - not exactly sewing related or Christmases. Hope you all manage some quiet time over the festive season to get a little sewing in - helps soothe the nerves. Merry Christmas to you all, and a safe and Happy New Year. Looking forward to 2014. Intentionally, or unintentionally, we never got around to cutting Ruth's hair and a couple of weeks ago she turned nine. My husband and I loved it being long but it was a lot of work for us both to maintain and re-plait each morning. And yes she is all smiles, thank goodness, even Grace had a trim. All she wants to do is brush it, and tonight she went to bed without a plait. I think I'll go and do some more cutting out. I am doing Bonnie Hunter's Celtic Solstice Mystery quilt. More on that later. Happy sewing everyone and I'll see some of you at the NOTYQ Guild Christmas lunch tomorrow. Thankyou again Diane - a job well done. Thought you'd like to see what I made this year for Ruth's teacher. I believe this stitchery is a Gail Pan design which she had on her blog a while ago as a freebie. I just thought it was so cute. The little handmade button came from Shabby Shack, an online Australian store which has the most gorgeous bits and pieces. I get a daily email from them with some great deals. Today my DH and I went to Lilydale to check out a shed, it's finally coming together. So naturally while there we visited the Stitch N Patch shop, I had a lovely browse while the better half took a look across the road in the Antique shop. Don't know who got the better deal - I picked up some lovely bits n pieces including the little redwood hanger for this stitchery while DH walked in with 'another' vintage Singer - boy did that cause a few laughs in the shop - I have to admit that it is quite cute. It's an 1881 Singer New Family, basically complete - just missing a bobbin winder and treadle stand, but I'm sure that won't be an issue - which usually means that there is another one already in our possession which will complete it. We then had a restful afternoon. I'm tiring easily at the moment. Now the girls are decorating the Christmas tree while I relax and listen to some cds of Christmas songs - lovely.